Most likely not. Expensive and they really dont help you win. You Ko everything on the field but their affects are......poor. You Ko everything on the field but their affects are......poor. You do not KO everything. You only KO the non-zombie versions of themselves. Zombie Magneto is very annoying to play against. You essentially kill everything when they are fielded. I know its only Zombies. Has there been confirmation of chase rare cards in War of Light? Confirmation of 4 extra Super-Rares, yes. Confirmation of Chase variations, no. I'm saying that you will most likely kill everything. No one really plays zombies. Minus the possibility of Zombie Magneto. Chase Super Rares are the cards with alternate art. The normal Super Rares are just one's without alternate art. They are called chases because you literally chase to get those cards. Buying multiple gravity feeds or buying them off someone/trading. There are 4 "normal" Super-Rare (Captain Universe, Groot, Jocasta, & Thanos - all have more common variations). Plus there are 4 "special" Super-Rares (Zombies - only exist as Super-Rares, max dice of 1, which it comes with). The standard distribution is 1-2 SRs per Gravity Feed. If you happen to get a Zombie SR, you have approximately a 1/7 chance that it will be full-art instead of "normal" art. I think you misunderstand how they work. They do not kill everything. They kill all non-Zombie versions of themselves and nothing else. These cards can work individually or cohesively and have the special Zombie ability “When fielded, KO all non-Zombie (Gladiator, Electro, Red Skull, or Magneto depending on which card is chosen) that are in the field.” This is a really cool way to add an alternate universe within Marvel into your games and effectively have the chance to cancel (or cannibalize!) all regular versions of these characters waiting in the field. 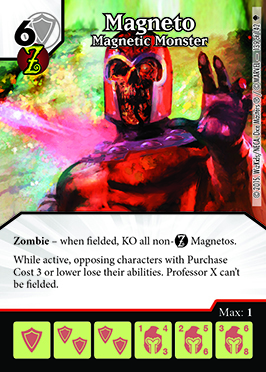 Your opponents who favor Magneto, Gladiator, Electro, or Red Skull in combat won’t know what hit them when you break out your Zombie army! Do you not understand where I'm going with this? They KO everything because people will most likely not be running Zombies. People will not run Zombie cards in their decks because their affects are poor and dont help you win. They are mostly a collectibles. I swear, you seem to nitpick in threads. I only seek to help. I am sorry that people sometimes don't see this. Last edited by Scorpion0x17; 08-02-2015 at 05:41 AM. Zombie Magneto only KOs Magneto, Zombie Red Skull only KOs Red Skull, etc. They dont KO everyone. FTR I did see your initial post as helpful (possibly snarky, but detailed and clear). I think there are a lot of people confused about the wording on the Zombie cards, which is why I posted the link to the Wizkids page explaining it. Some people think it is "All non-(Zombie Magneto)", while others think it is "All (non-Zombie) Magneto". The Wizkids page makes it clear that it is the second option, not the first. I did consider just removing the snark. But then my previous comments were, I thought, snark free, clear, and informative, and VastSpartan seems to have decided to take a dislike to me, so I figured it wouldn't matter how it was worded. 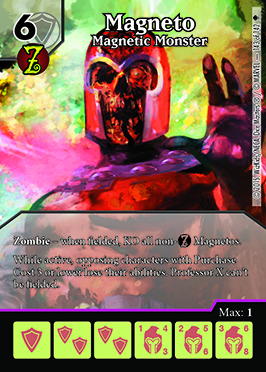 The zombie magneto is a solid card if you can protect it. Lord of d ring can protect it. Its nothing personal but through the forums your responses tend to have a snark to it. Last edited by Scorpion0x17; 08-02-2015 at 11:15 PM.